Renowned photographer Ernest Withers captured some of the most stunning moments of the civil rights era — from the age-defining snapshot of Dr. Martin Luther King, Jr., riding one of the first integrated buses in Montgomery, to the haunting photo of Emmett Till’s great-uncle pointing an accusing finger at his nephew’s killers. He had a front row seat to history as a man trusted and beloved by the movement’s inner circle . . . but few people know that Withers was also an informant for the FBI. 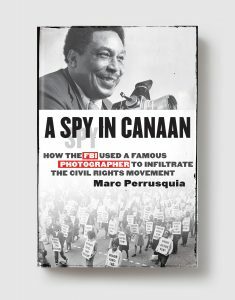 Memphis journalist Marc Perrusquia broke the story of Withers’s secret life after a long investigation culminating in a landmark lawsuit against the government to release hundreds of once-classified FBI documents. Those files confirmed that, from 1958 to 1976, Withers helped the Bureau monitor pillars of the movement including Dr. Martin Luther King, Jr., and others, as well as dozens of civil rights foot soldiers. Now, on the fiftieth anniversary of King’s assassination, A Spy in Canaan explores the life, complex motivations, and legacy of the fascinating figure Ernest Withers, as well as the dark shadow that era’s culture of surveillance has cast on our own time. MARC PERRUSQUIA is journalist for The Commercial Appeal, the daily newspaper in Memphis, Tenn., where he has worked the past 29 years. He has won numerous national awards for both feature writing and investigative reporting, a specialty honed over three decades working in a city long considered among the nation’s most corrupt.